In 1982, the oil rig Ocean Ranger sank off the coast of Newfoundland. All 84 men aboard died. February is a fictional narrative set twenty-five years after this real-life disaster. In February, Moore explores the protracted grief of Helen O’Mara; “one of those left behind” by the catastrophe. The problem I have with this is that Helen wasn’t “left behind” at all – because she isn’t real: unlike, I imagine, many, many tens of women whose husbands did drown in 1982, any one of whose story would doubtless have made more moving, interesting and poignant reading that this problematically fictionalised account. The problem with February, then, is entirely conceptual. With such a heart-breaking, community-shattering disaster as its basis, why does Lisa Moore feel the need to fictionalise the grief with made-up characters and events? It’s almost as if Moore wanted to write about the Ocean Ranger, but didn’t have the balls to write a straight-up novelisation of the actual disaster, and so made up her own story and set it 25 years later. Why the need for this fake chronicle set so long after the fact? Moore’s narrative is just dull, dull, dull compared to its real-world inspiration. The sinking of the Ocean Ranger is the story I want to read about: that’s where my interest would lie: not in this bizarre, pseudo-realistic aftermath set in the present day. Even a book of interviews with the surviving widows would have made a more fitting tribute. It’s an age-old argument: at what point does ‘inspiration’ verge on exploitation? Moore is happy enough to use the “convenient” truth of the actual disaster upon which to ground her novel, but while the sinking of the ship is taken de facto, the real aftermath and individual pain of the event is ignored in favour of Moore’s fictional heroine and her fictional grief. Is this a form of authorial cowardice: is it easier to fictionalise the present than to engage with it? Or maybe the real-life stories of the Ocean Ranger widows just weren’t interesting enough, neat enough or…dare I say it…tragic enough to make an entire book? If pain actual is too morbid, is pain fictional less uncomfortable? This is supposedly a novel about real grief and loss: but it’s not – it’s a novel of literary, eloquent and articulate grief: the artifice of which wrenches any impression of realism away from the reader and reinforces the book’s identity as fictional dalliance as the characters constantly self-analyse. The truth is a rabid dog constantly attacking February: but instead of wrestling it to the ground and tackling it head-on, Lisa Moore tries to shoo it away, hoping that it’ll eventually limp off. Usually I would find such a tension between fact and invention fascinating; but, in this case, it made me incredibly uncomfortable. Especially at the book’s dénouement, that is so full of promise, hope, happiness and life as to bathetically undermine the emotional premise and tone of the entire novel. But maybe I’m taking all this too seriously, maybe the fact that this novel is based on true events isn’t meant to matter – but if that’s the case, then why do the book’s editors take such pains to constantly remind you of the novel’s historical inception? From the blurb inside and on the back of the book, to the meticulous obsessing over precise dates and times within the narrative: the book screams at the reader: “This Rig Really Sank!”. As hard as I tried: I just couldn’t ignore the truth behind the fiction. And I did try; because sentence by sentence, word by word, February is beautifully written and constructed with intricacy and care. The non-linear narrative skips and warps through the twenty-five year aftermath with masterful poise: doubling-back on itself, and back again, yet somehow always progressing the story forwards. Moore’s physical description of place and weather (often tonally sympathetic to her characters’ moods) is enjoyable and powerfully evocative of the winter cold, or the waveforms of a disturbed ocean, a firework display viewed from a distance or, for that matter, anything Moore puts her mind to. Make no mistake: there is nothing wrong with the writing itself. I suppose that the best way to read February would be to imagine the entire scenario as a fiction. In fact, I wish it were. But there’s an unspoken spectre that haunts this narrative, one I just couldn’t ignore. There’s an uncared for truth and reality that, unmentioned, reinforces an unsettling sense of artifice on the novel. One day, probably soon, Lisa Moore is going to publish something incredible; this just isn’t it. She’s a very powerful, eloquent writer, and I look forward to reading something by her that isn’t problematized by a fiction/reality tension. 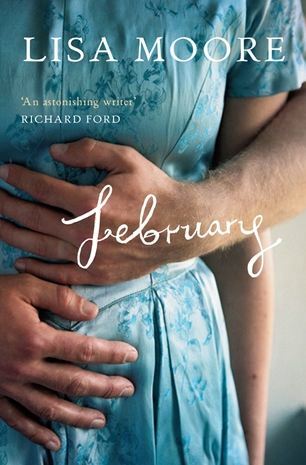 This entry was posted in Novels, Reviews and tagged Booker Prize 2010, February, Lisa Moore. Bookmark the permalink. I think if you’re going to take on a real life event, you need to focus on the reality of it, which it sounds like they did not here. Perhaps it would have benefited from an “inspired by” tag, and then the use of a fictional rig sinking, so there was no reality to fail to wrestle with. Had the event happened long enough ago that there were no widows to speak to, or take inspiration from, then perhaps it would be forgivable to ignore them in favor of a fictional being, but 1982 was not so long ago that it can be ignored. It’s interesting to read this now, some years later, and for you to have to reread it too. As I read your post, one of my first thoughts was that you were hoping for a very different book, a thriller, an action oriented account of what really happened. It is clear that Lisa Moore isn’t likely to be the one to write that book. She has purposely remained somewhat detached from the actual events, even though through her character Helen, she has studied what actually happened and how it may have been resolved obsessively. But it is a novel about grief and the aftermath of someone coping with an unexpected death. And in that respect, she appears to have channelled some of her own experience, having lost her own father just a couple of years before this tragic event, so observed how that grief shaped those it affected. I guess she chose the Ocean Ranger disaster, to make it less about her own family story, and so imagined the grief of those people and was able to channel some of it having observed her won family? although it is interesting that she chooses to develop the mother and son characters and not either of the girls, when her own family is composed of two daughters, she was 16 and her sister 12 when their father died. I guess I just accepted that this wasn’t a book about the event as much as it was both reflection on surviving the death of a loved one and that ever present survival instinct, as necessary for the living as for those trying to escape death. I didn’t find it any less moving, for being based on a fictional character, I was wondering what the response might have been, if she’d been more vague about which event it was provoked by, if she never mentioned the Ocean Ranger by name, we’d be less curious about the actual event. It reminded me of Philippe Claudel’s La Petit Fille de Monsieur Linh, in which we encounter the protagonist on a boat going somewhere, we understand it is probably post-war, maybe somewhere in Asia, but he never divulges exactly the event that precipitates his fleeing the country and where exactly he lands and who the people are that welcome him, we must accept the narrative for what it is, its universality. Perhaps it is better to be inspired by a true event and then not reveal it, it keeps the reader focused. It may be that it’s too early to write a novel about the real victims, people still feel the loss today and if a writer hasn’t experienced that loss themselves, it becomes an even more onerous task to represent it on behalf of someone else, I understand both Moore’s cowardice at prying into the lives of those who continue to suffer and her bravery at choosing to channel her own family’s grief, as they too had to cope with an unexpected and sudden loss of a loved one. I love what you have to say about the writing, it was transportative, intricately structured and I liked that juxtaposition between the introspective thoughts and the interruptions of life that moved her forward, the phone ringing, a man renovating, a baby due to be born. I did wonder about the daughters lack of development, and now I think that they were perhaps too close to home, maybe the author was not quite ready for that kind of self-reflection.